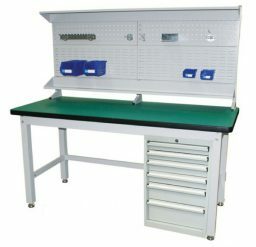 Krosstech heavy duty modular workbench system has an optional peg board panel and lockable drawer set. 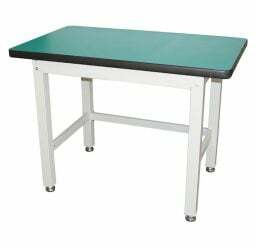 These workbenches have a 1000kg top bench capacity. Constructed from heavy duty powder coated steel the multi-functional commercial frame provides maximum rigidity for the most demanding industrial applications. 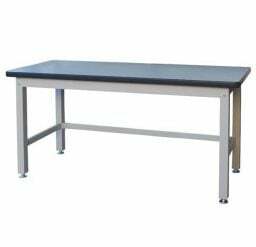 Finished with a rounded PVC edge the 41mm medium density laminated bench top is very durable. Comes standard with adjustable feet for levelling on uneven floors – castor kit available. 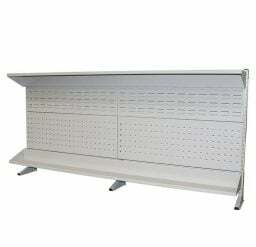 The optional back panel set come with shelves and both square hole pegboard and louvre panel. This incorporates a fixed top and bottom shelf and is a great addition. A complete range of tool hooks, hangers and storage buckets are also available making storing and locating your tools much easier. To complete the package a 6-drawer tooling cabinet designed to fit underneath the bench is another great option. Featuring a range of plastic boxes in the top drawer it would be ideal for the storage of small parts such as screws etc. The lower drawers incorporate movable steel dividers which allow you to configure the space to suit your application; this great work bench solution shown can be individually purchased to suit your requirements. Benches available in 1200mm, 1800mm and 2100mm long.